Kratos. Now there's a rage-filled video game character for you. Just look at him, perched there, glaring through the screen. He doesn't even have limbs and I'm still scared he's gonna come beat me up. Ok, but back to the bust. This is just a picture of a statue, and I'm having a hard time maintaining eye contact. 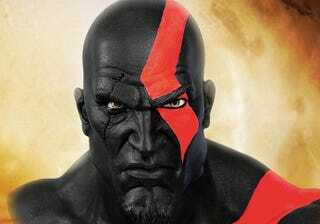 Oh, Kratos, that's why you look so peeved. You've got a pedestal coming out of your upper back! Welp, I'm not sleeping tonight. You can see more photos of Fear Kratos in his statuesque fury over at the Gaming Heads website. And if you have $600, you can secure one for yourself before they go on sale later this year. Gaming Heads only made 100 available, so get him while he's angry!